Famous People from Farnham | Curchod & Co. This historic market town certainly has an intriguing history. 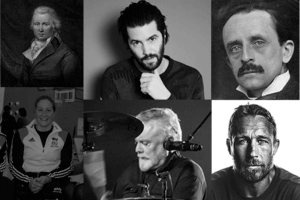 Did you know that Farnham has played host to many famous faces, some of which are listed below, and whom were either born or have lived in the area at some point in their lives? English pamphleteer, farmer, journalist and member of parliament, who was born in Farnham, Surrey in 1763. Builder of Britain’s first petrol-powered motor vehicle. Scottish playwright and novelist, best remembered as the creator of Peter Pan. Former Captain of the England Rugby Team with a net worth of £14 million in 2014. The voice of Soo from Sooty and Sweep, a popular children’s programme in the 1990s. Drummer for the rock band Queen. Drove for Ferrari and became the first British Formula One World Champion in 1958. English television presenter and personality, best known for co-presenting the BBC children’s magazine programme Blue Peter in the 1960s and 1970s. Trinidadian-British news presenter and journalist. British Paralympics hand cyclist who won a gold medal at the 2008 Summer Paralympics. British builder and campaigner for British Summer Time (1856). Famous names plaques can be seen in South Street on the outside wall of Sainsbury’s.